Anita DeFrantz, in with the medalists and USRowing CEO Patrick McNerney at the 2017 World Rowing Championships, Nathan Benderson Park, Sarasota-Bradenton, Florida. PHOTO PETER SPURRIER. Two years. If you had a two-year span in your career that was a natural break between roles, what would you slate into that timespan? Row full-time? Start a new business? Travel? When Anita DeFrantz, who won a bronze medal in the first Olympic women’s eight in 1976 and has been a member of the International Olympic Committee since 1986, left her post in Los Angeles as the head of the LA84 Foundation two years ago, she put two things on her to-do list: bring the Olympic Games back to the United States and write her memoir. She’s done both. The Olympics will be hosted by the United States in 2028, in Los Angeles, and My Olympic Life, A Memoir, was recently published by Klipspringer Press. If you’ve watched Olympic rowing events and the ensuing awards ceremonies, you probably would recognize DeFrantz. She’s often the International Olympic Committee member on the rowing medal stand who awards the Olympic medals to the winning teams, placing them gently over the athletes’ heads so they rest perfectly on their chests. But, even though she was a rower, her reach in sport goes well beyond rowing. DeFrantz, a natural negotiator, is trained as a lawyer. Her upbringing in Indiana in the 1950s and ‘60s put her in the middle of an era—and a place—that solidified the drive she took into rowing. That drive helped the United States win a medal in the debut of women’s rowing at the Olympics and, since then, has spilled over into other sports and touched millions of athletes. Literally, millions of athletes. In her work on the International Olympic Committee, she is known for constantly striving for equality for women’s sports in the Olympics. Two sports she is credited for shepherding into the Games are women’s soccer and softball. Millions of athletes. DeFrantz’s childhood was sprinkled with situations that were reflective of the tenor of America. In a recent interview, I asked DeFrantz if she thinks her ability to achieve so much for sport was grounded in the upbringing her parents ensured she had. “My family prepared us—all four of us—to be successful in the world we were to inhabit,” she said. DeFrantz’s path as a young black woman went from Indiana to Connecticut College, where she just happened to take up rowing as an undergraduate. This was at a time when women’s college sports programs were just beginning and girls’ sports in high school were virtually non-existent. DeFrantz is tall and athletic. Her coach encouraged her to continue rowing and, in a move that was bold and naïve at the time, she found herself in training camps at Vesper and in Princeton and Boston, trying out for a seat on the national team for the 1976 Olympics. Two years earlier, in 1974, DeFrantz entered graduate school at the University of Pennsylvania, and fortuitously, joined Vesper Boat Club. While she was working toward her law degree, she rowed, studied, and worked to support herself. In 1975, in preparation for selecting the first women’s Olympic rowing team, USRowing changed the way the world championship boats would be selected; specifically, lineups would be chosen during a camp in Boston and not from the national championship regatta. The Vesper rowers each worked at full-time jobs and didn’t have the means to travel to Boston for the selection camp. What followed was the beginning of a pattern that would repeat itself several times over in DeFrantz’s life: she would challenge a major governing body or institution, standing up for her beliefs and for other athletes. 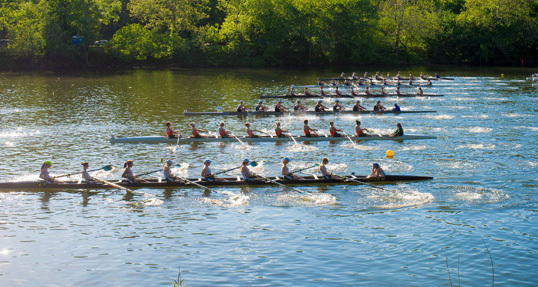 In this case, at the request of her Vesper teammates, she initiated an arbitration against USRowing for the right to have the national team boating orders decided at the national championship regatta. Four years later, she would bring suit against the United States government, challenging the right of Congress to boycott the 1980 Olympic Games. DeFrantz went on after her rowing career and law school to become a force in the world of international competition, not in a boat but in the board room of the USOC and IOC. Today, she is a vice president of the IOC, having been recently elected to a second stint in that role. I ask DeFrantz if she thinks she would have been on the radar of those sports bodies if she hadn’t been the athlete’s advocate while she was rowing. “Not so much,” she says. “That time—those situations—shed a light on me, it let people see, ‘Who is this person?’” DeFrantz goes on, “I knew a lot of the rowers and the track athletes,” she explains. “They would call me up. I knew [the Olympic environment] had to be right for the athletes. I was determined to give something back.” I sit back in my chair. The irony of this is poignant, and I wonder if there are lessons here we haven’t yet learned. How could she have challenged the status quo in such a way that allowed the organizations she was challenging to seek her out, to vote her onto their boards, to give her the reins? After rowing on the national team, after challenging USRowing and the USOC on selection procedures, after bringing suit against the federal government for overstepping its bounds in boycotting the 1980 Olympic Games, DeFrantz began what she thought would be her law career: representing those who needed representation in inner-city Philadelphia. It wasn’t long, however, until she returned to the world of sport. This woman, who had captained the U.S. women’s rowing team as it entered the international rowing scene, who had represented athletes in multiple legal battles, then joined the same organizations she had been challenging. It is here where she began what can be seen as one of the great unifying stories. DeFrantz became the voice on the inside, bringing a position that was, first and foremost, powerful for its unifying quality. She understood that there can be multiple views on one topic. She had grown up learning that different ideas can be true and valid. She knew that each idea needed to be heard. In short, she understood the plurality of ideas. And she was just the person to bring these ideas to the table, to discuss and debate and push for decisions that would alter the face of international sport forever. Her career—from the 1984 Los Angeles Olympic Organizing Committee to the United States Olympic Committee to the International Olympic Committee to her time as the head of the LA84 Foundation, stewarding the 1984 Olympic surplus to support youth sports—can be seen as one of the most important careers in the development of sport. DeFrantz has been included in so many of the “most influential people in sport” lists that if there was a list of people who have appeared on the most lists, she would be on that one, too. When I ask DeFrantz about her work to bring women’s sports to the international level in an equitable manner, she says, simply, “A lot of things happened quietly, and needed to be that way. I was very fortunate to be a part of it.” The stories in her memoir tell the inside track of the emergence of women’s sports in the Olympic Games. As the first American woman and the first African American to be elected to the International Olympic Committee, DeFrantz had a platform for equality. She was appointed chair of the IOC’s Women and Sports Commission in 1995, a role that would demand from her all of the lessons she had learned in her youth. “No significant change happens because of one person’s work,” she writes, toward the end of her memoir. As she talks, I think back to an early quote in her memoir, a lesson from her parents that she learned as a child. “The present, I was taught, was not a consolation prize for the future.” The present world of sport is a product, in many ways, of this lesson. DeFrantz’s work has been instrumental in bringing opportunities to all athletes. Having a lawyer who understands the importance of seat racing, who knows the impact of the plurality of ideas, who remembers what competition feels like is the person who had to be on the International Olympic Committee, who had to shepherd through equality in sport at the international level. This is what had to happen. He sounds like a rower, too.